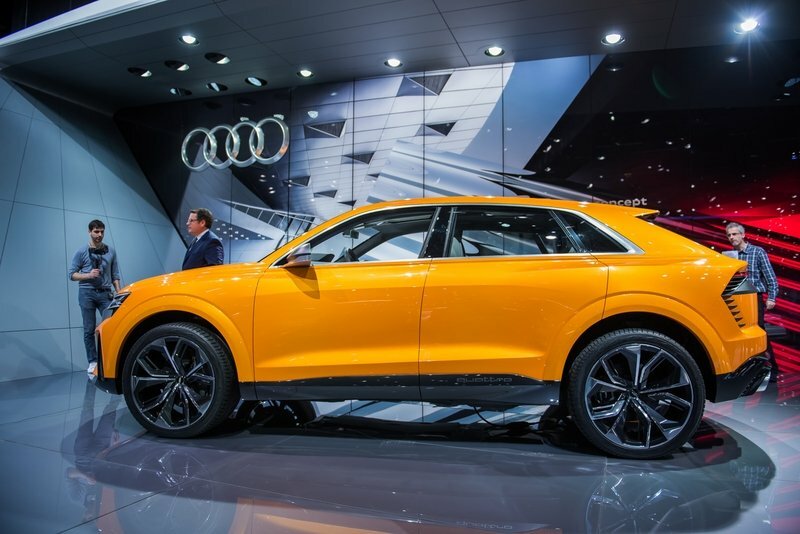 For the time being, the top of the Audi crossover pyramid is occupied by the Q7, a full-size luxury SUV that originally debuted at the Frankfurt Motor Show in September of 2005. Now, it appears as though the Four Ring brand is looking to go plus one with the new Q8. 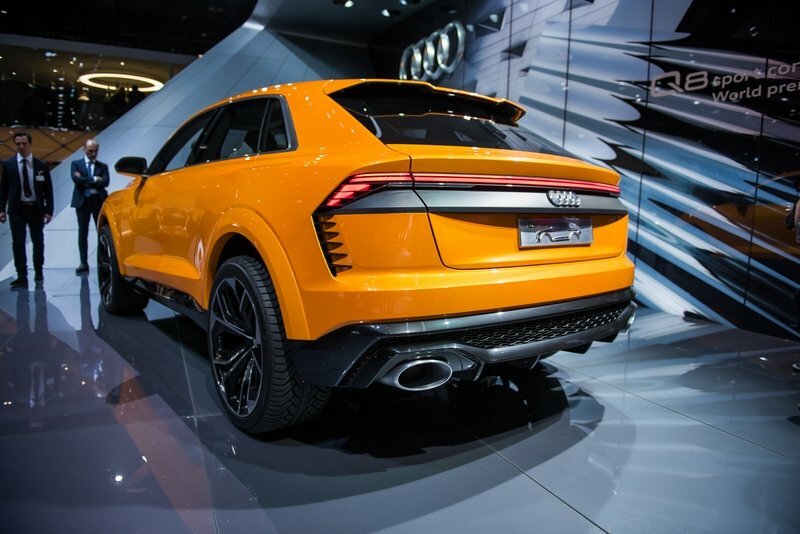 Initially shown this past January at the Detroit Auto Show, the Q8 is just a concept for the moment, but Audi seems intent on fanning the flames of interest with a brand-new concept called the Q8 Sport Concept. 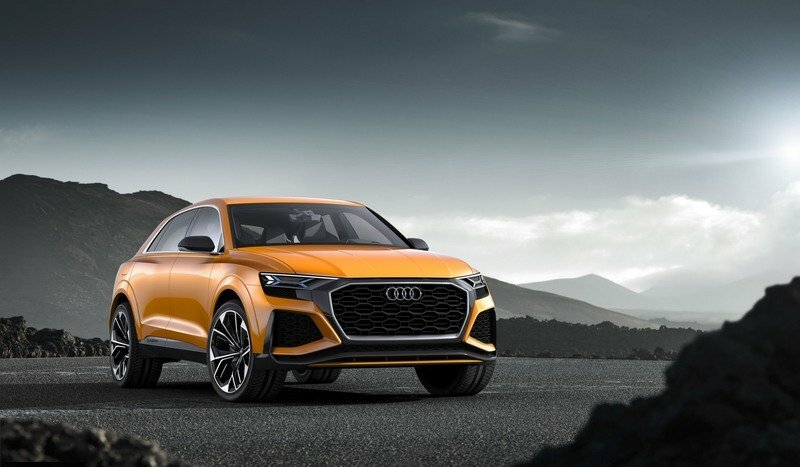 This latest design study debuted at the Geneva International Motor Show, and adds a bit of zesty flavoring to the previous Q8 concept. 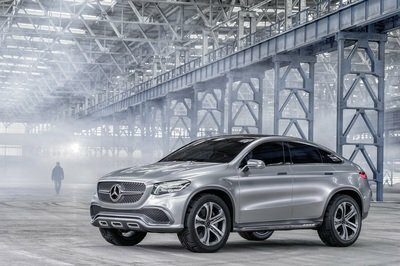 It’s supposedly faster and more entertaining behind the wheel, bearing a high-tech hybrid twin-turbo 3.0-liter V-6 powerplant, as well as attractive new styling ideas for the exterior and interior space. 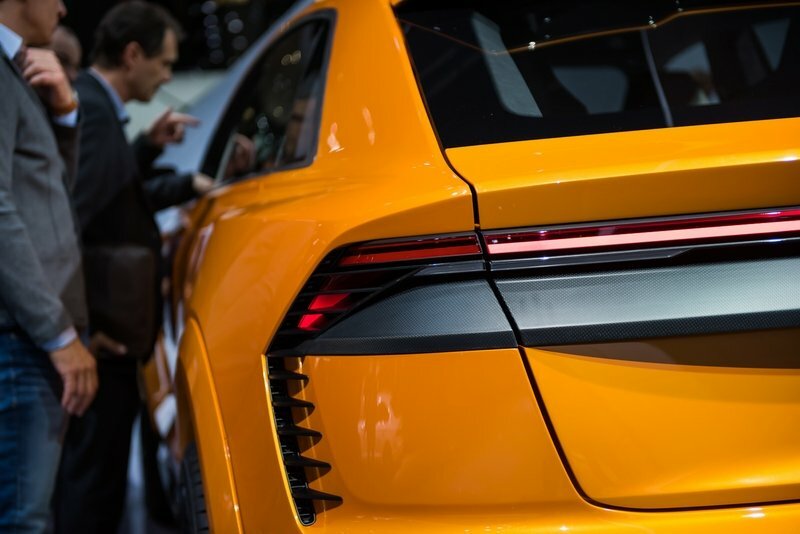 Those new aesthetics follow the path originally laid out by the Audi Prologue Concept that dropped cover at the Los Angeles Auto Show in 2014, rocking lots of horizontal lines, thin features, and highly angular cuts. 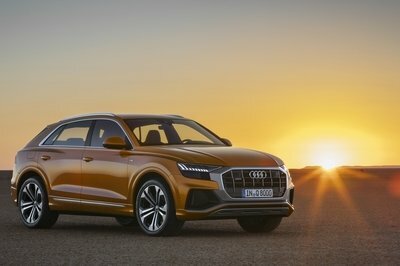 It looks pretty good, but the other half of the equation is in the powertrain, which previews a possible future innovation heading for the Audi production line. The aim of the game is power and fun when you want it, plus efficiency when you don’t, which is a tough nut to crack by any measure, but especially when you’re dealing with an enormous SUV. 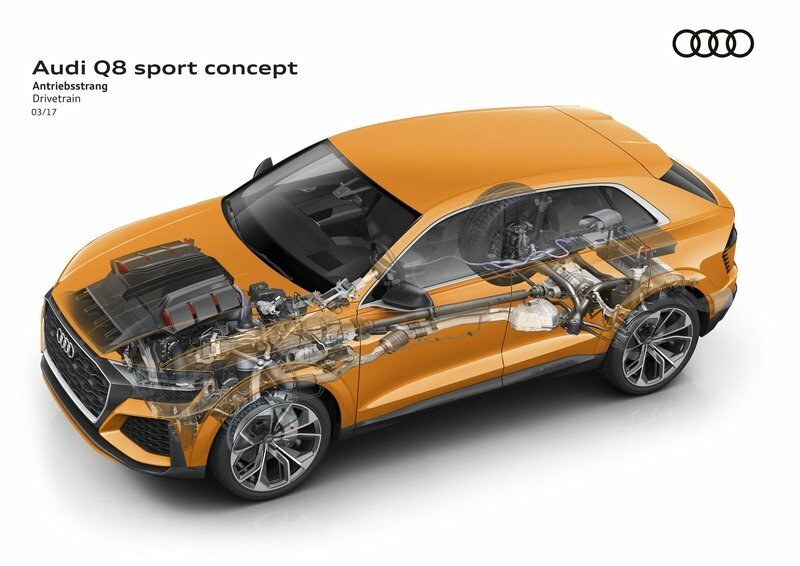 That said, Audi is giving us a surprising amount of specificity when laying out the Q8 Sport Concept’s various specs and numbers, leading us to believe the marque will indeed release something very close to this chopped-up concept in the not-so-distant future. Interested? Read on for more info. 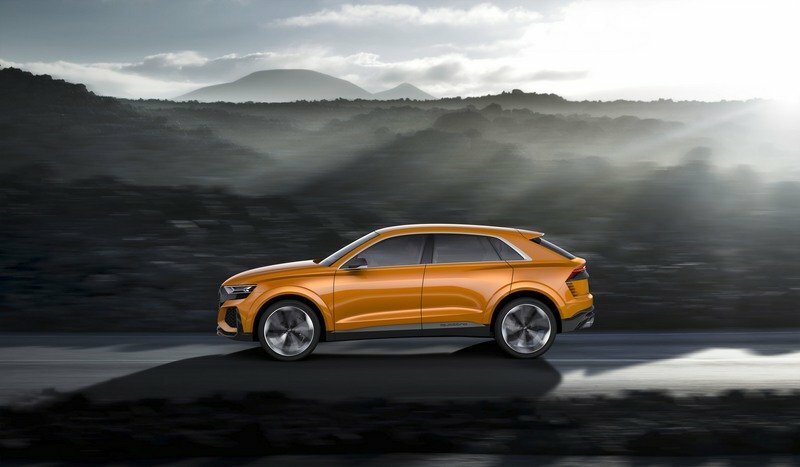 Continue reading to learn more about the Audi Q8 Sport Concept. 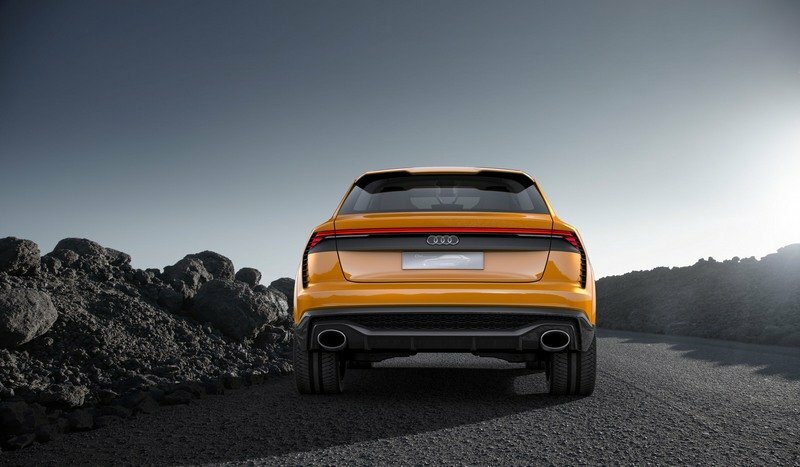 In terms of aesthetics, the Audi Q8 Sport Concept is more of an evolutionary design rather than a revolutionary design. It’s got many of the same touches we’ve seen from Audi’s other concepts in the past, with tons of angular touches and deep cuts. These characteristics are seen prominently in the front fascia, which includes an octagonal Singleframe grille. While this shape is common amongst Four Ring badges, on the Q8 Sport Concept it’s significantly wider than the brand’s current crop of production cars. Inside the grille is a honeycomb insert with aluminum dividers, as well as a contrasting frame to give it even more visual girth. In the lower corners you’ll find enlarged intakes, undoubtedly added as a means of underlining the model’s inherent sportiness. In the lower corners you’ll find enlarged intakes, undoubtedly added as a means of underlining the model’s inherent sportiness. Aiding the aero is a lower splitter blade element, while higher up are integrated headlights that come connected by the large central intake frame. The headlight housings are also made from aluminum. 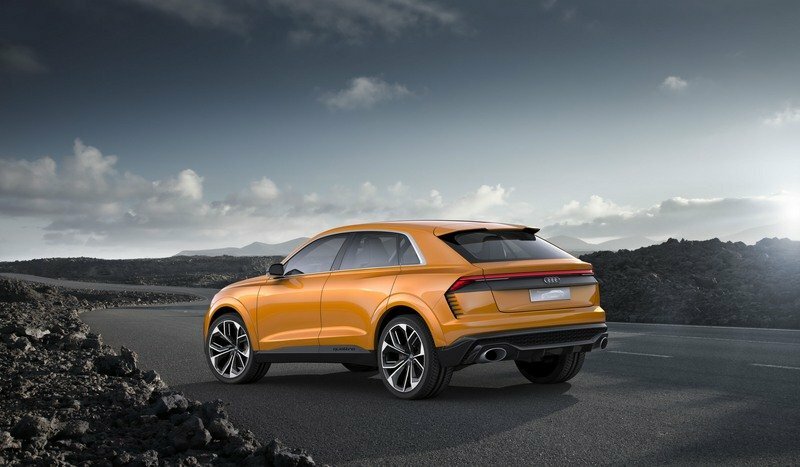 Move to the side and you’ll find the Q8 Sport Concept’s coupe-like roofline, a common feature amongst sporting crossovers, including those from rival makes like Mercedes and BMW. Look closely at the black side skirt moldings underneath the rear doors, and you’ll find Audi’s all-important quattro logo milled into them. The minimal side view mirrors are capped in carbon fiber trim, while the C-pillar was shaped so rally fans would be reminded of the Audi quattro from the ‘80s, the world-beating legend that introduced the world to the joys of permanent AWD in a passenger car and in top-shelf rally competition. The C-pillar was shaped so rally fans would be reminded of the legendary Audi quattro from the ‘80s. Move towards the rear, and you’ll find a spoiler attached to the trailing edge of the roof with an indentation in the middle that gives it a “double-flap” like appearance. The taillights – or rather, the singular taillight I should say, is a solitary strip that spans the width of the car. This light strip is also used for braking and the dynamic turn signals, and it adds some serious visual width to the entire rear end. A strip of black trim is mounted above the license plate, while a carbon fiber crosspiece and aluminum diffuser is underneath the bumper. The dual exhaust tips have an aluminum finish and an oval shape. The whole shebang is slathered in a “krypton orange” paint job, which looks bright enough to blind even the strongest of superheroes. 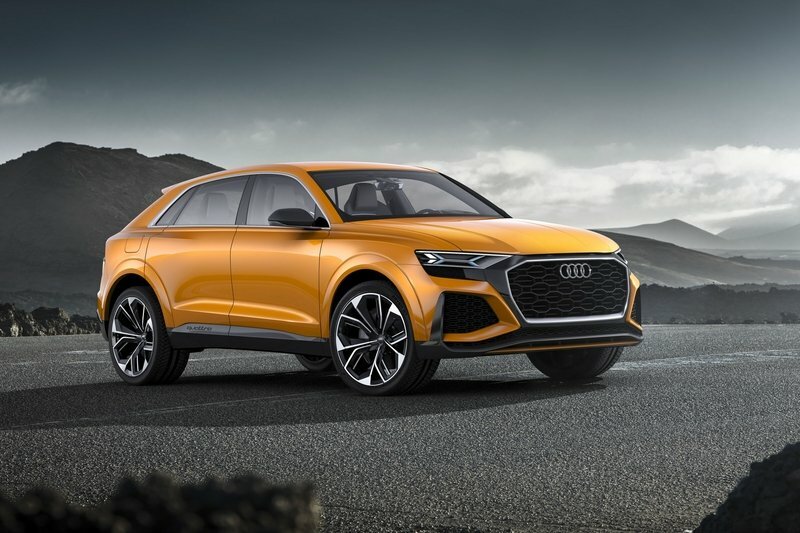 Note: previous Audi Q8 Concept pictured on the left, current Audi Q8 Sport Concept pictured on the right. 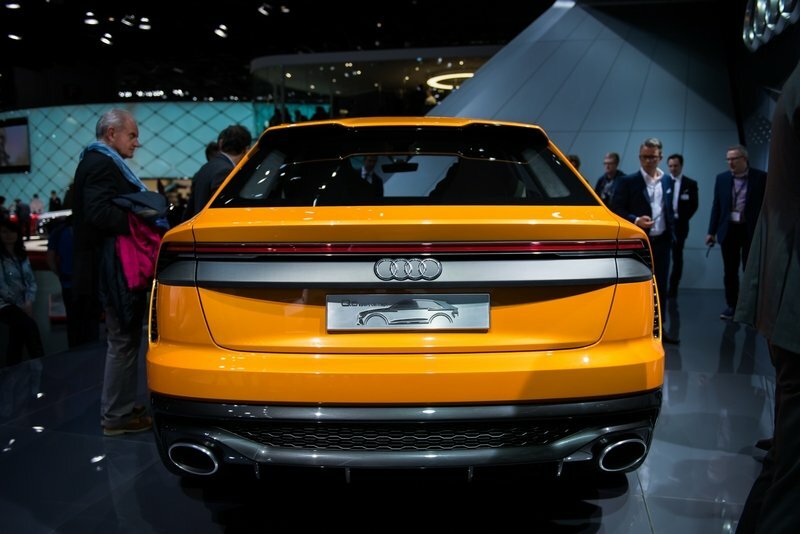 Placed next to its predecessor, the Audi Q8 Sport Concept looks quite similar. 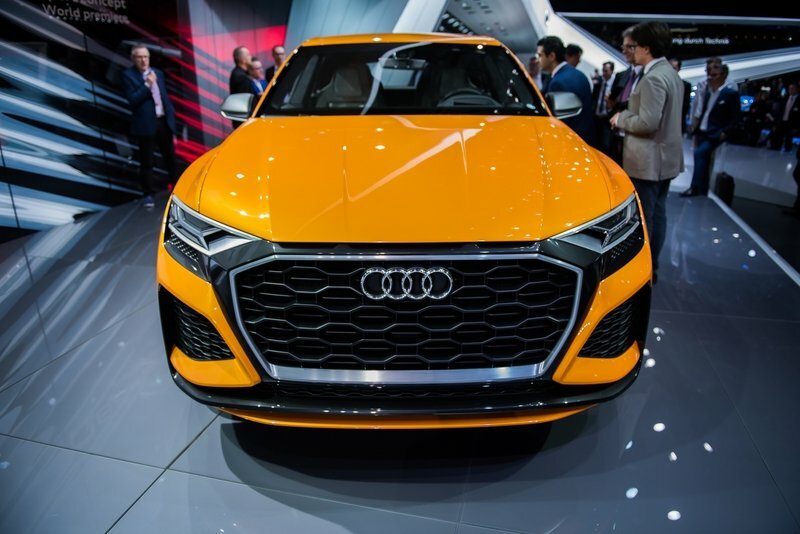 However, Audi is quick to point out new details like the larger grille and side intakes, plus the new colors and trim. However, it should be mentioned that the wheels and side skirts look practically identical. But that’s to be expected. If both concepts preview production vehicles, with the first as the standard model and the second as the Sport trim, the aesthetic differences would most likely be just as close. Audi also points out a greater focus on aero efficiency for the Sport Concept, although not much was said about specifics like the drag coefficient. LEDs were used for the dynamic turn signals and daytime running lights, which means all the lights on the concept are considered “dynamic.” Further interesting details include a blue laser light signature with an x-shape. The exterior measurements come in at 16.5 feet in length, while the wheelbase is 9.8 feet long, about right for offering lots of space inside. The concept is also 6.7 feet wide and 5.6 feet tall. 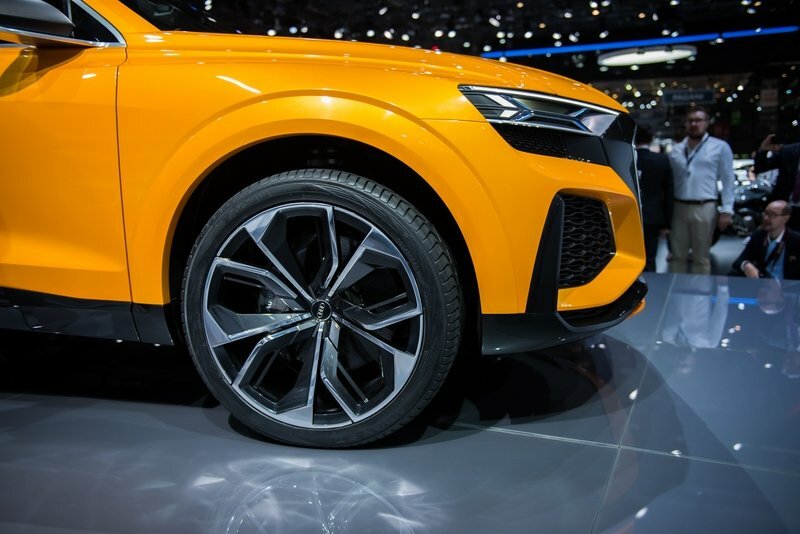 Compared to the previous Q8 concept, the Sport’s wheel housings are 0.5 inches wider. 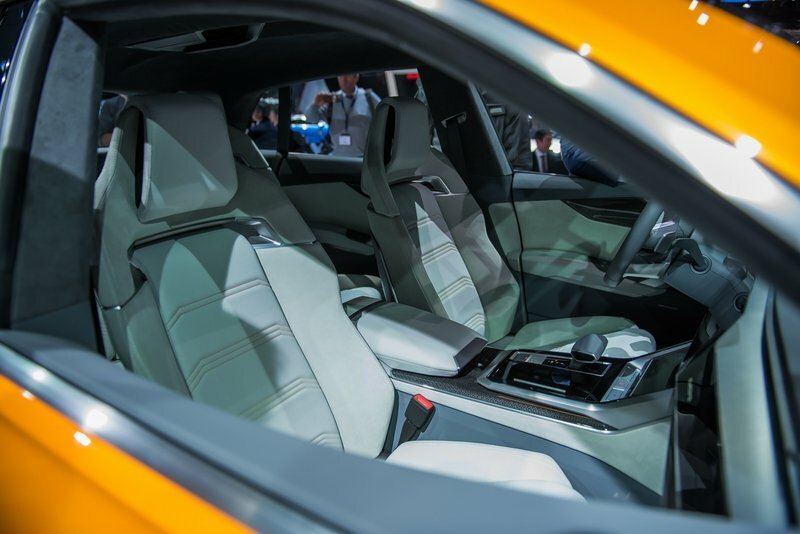 Inside the Audi Q8 Sport Concept, the look is sharp and futuristic, but not entirely out of line for something you might see on a model destined for production status. It’s all extremely wide, with long horizontal design elements that seem to sweep across the dash, and thin, geometric shapes placed here and there. 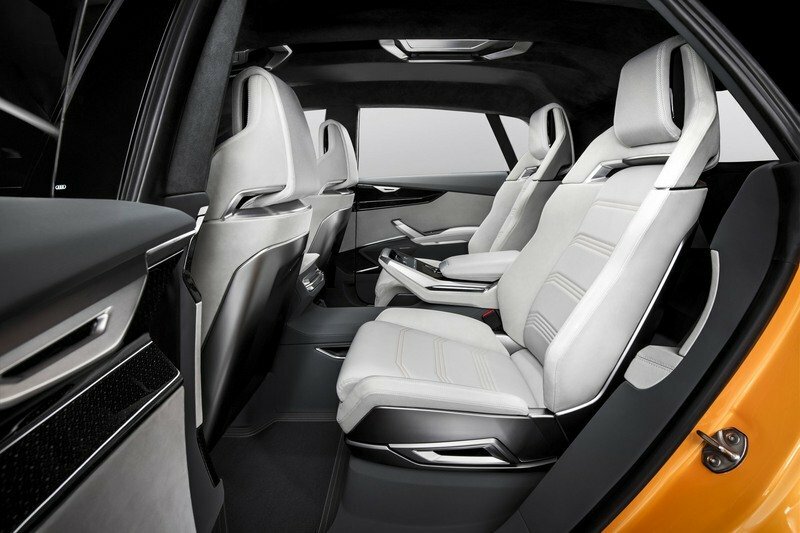 There are frameless windows for each of the doors, giving the crossover its desirably flat roofline, while seating is capped at four with sizable side bolsters to keep folks in place during hard cornering. Materials used include brushed aluminum for the door kick plates, as well as the center console, the dash, the doors, and the flat-bottom multi-function steering wheel. Piano black inserts and glossy black surfaces complement the bright trim and upholstery, plus carbon fiber was added here and there to up the crossover’s inherent sportiness. The shift-by-wire lever was placed above the central tunnel. LEDs were used for the lighting, and a gradient in the colors add a little extra splash between the headliner and console, morphing into a spread of greys and pastel silvers. LEDs were used for the lighting, and a gradient in the colors add a little extra splash between the headliner and console, morphing into a spread of greys and pastel silvers. This is repeated in the seats, which are draped in Nappa leather and Nubuk leather, and finished in pastel silver. Passengers will ejoy the individual climate control zones. To maintain some degree of efficiency, these zones are deactivated when no passenger is detected in the seat. Getting into the Q8 Sport Concept is facilitated via touch sensors in the Audi rings, which are placed on the B and C pillars. Touch these, and the door will pop open to let you in. The rear hatch is also power operated. 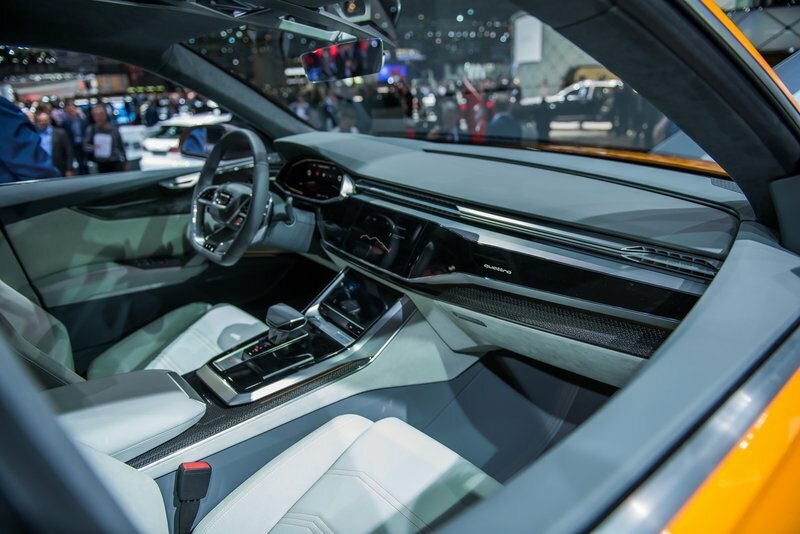 In terms of infotainment, the Q8 Sport Concept gets advanced navigation systems that provide the driver with predictive efficiency capabilities (more on that in the next section). 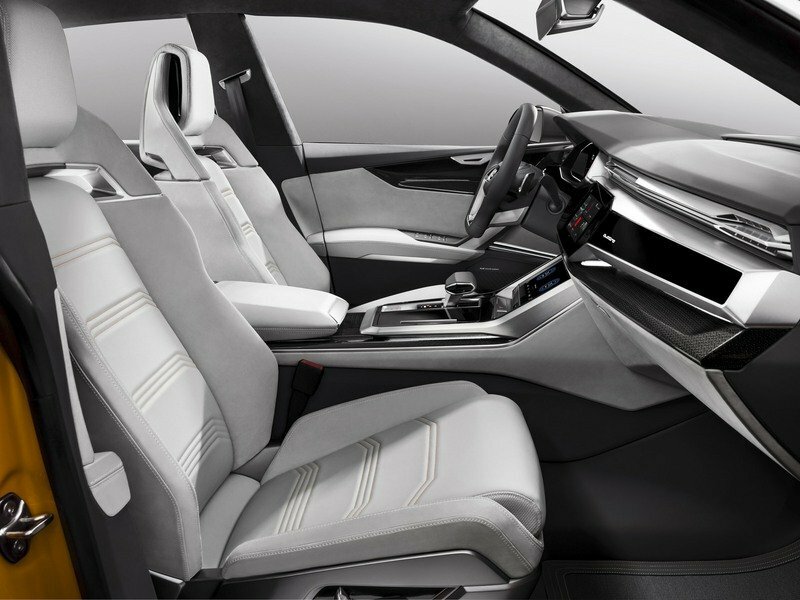 The infotainment also gets a variety of car-to-X services via the Audi connect system. To view and control the various settings onboard, the Q8 Sport Concept gets a number of large touchscreens. Starting things off is the Audi virtual cockpit, which is basically digital TFT instrumentation that’s placed behind the steering wheel. Resolution for this is set at an impressive 1,920 by 720 pixels, with measurements rated at 12.3-inch in the horizontal. There’s also something called a contact-analogue heads-up display with intelligent augmented reality tech that apparently “merges the real and the virtual worlds.” Cool. Audi included something called a contact-analogue heads-up display with intelligent augmented reality tech that apparently “merges the real and the virtual worlds.” Cool. This heads-up display is used for vital driver information such as navigation and the like. It’s also used to relay important driver notification updates, and info on the various driver assist systems. As an example of this augmented reality feature, Audi says the heads-up display will project a giant arrow that points the way to your destination, kinda like something you might see in a video game. There are a variety of ways to view and access the available infotainment systems. For example, you can look at nav info via a top-down map, plus there’s a three-dimensional display for the speedometer and powermeter. Controlling it all are buttons on the steering wheel. It’s no surprise the various touschscreens play the biggest role in the control scheme. Audi says this was intended to reduce the number of hard buttons in the cabin for a cleaner look. It’s no surprise the various touschscreens play the biggest role in the control scheme. Audi says this was intended to reduce the number of hard buttons in the cabin for a cleaner look, with the central MMI display providing the control hub for the climate settings through a diagonal sloping section in the central console, which also helps to accommodate the driver’s wrist when it’s resting on the shifter. Another small touchscreen is placed to the left of the steering wheel for operation of the lights. Finally, it should be mentioned that the Q8 Sport Concept offers lots of cargo space in back, with 22.2 cubic feet for stuff. Compared to the current Audi Q7, that’s actually a sizable amount of space. For reference, we’ve included the interior measurements for the 2017 Audi Q7 below. 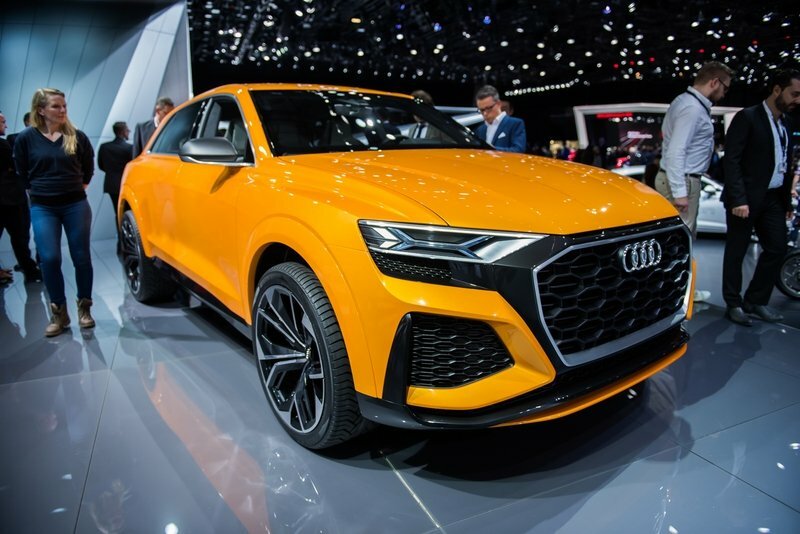 While the Audi Q8 Sport Concept does offer a few interesting ideas in terms of styling and interior layout, the really interesting features are found under the hood. Like many things in life, the good stuff starts with a turbocharged, gas-burning internal combustion engine – a 3.0-liter TFSI six-cylinder, to be exact. To this basic configuration, Audi added something it’s calling a “mild” hybrid system, or mHEV, as well as an electrically operated compressor. Total output comes in at 476 horsepower and 516 pound-feet of torque. 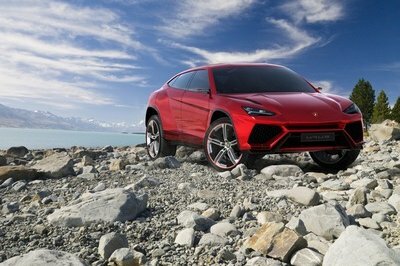 Total output comes in at 476 horsepower and 516 pound-feet of torque, all of which is dumped to an eight-speed tiptronic transmission. Extra grip arrives courtesy of Audi’s quattro AWD system, as expected. Properly motivated, acceleration specs look like 0-to-100 km (0-to-62 mph) in 4.7 seconds, while top speed is rated at 171 mph. 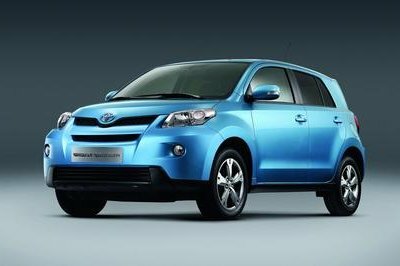 So it’s quick, but the set-up also offers a range of 1,200 km (746 miles), making this one hybrid that can definitely go the distance. But it’s the details that really make this powertrain shine. But it’s the details that really make this powertrain shine. There’s an energy recuperation system onboard that will accumulate up to 20 kW in extra power. Making it happen is a starter generator that’s mounted between the crankshaft and transmission, creating a slow draw to help soak up errant energy when needed, such as under braking. The system can also keep the SUV moving ahead while in stop and go traffic, even with the engine turned off, which means the driver can go full EV mode when the time is right, and thus maximize efficiency. This generator can also be called upon to produce heaps of additional power, similar to an electric motor in a performance hybrid vehicle. Pair the ICE and electric motor as a single unit, with the 20 kW and 125 pound-feet of torque added from the electric motor, and you get nice dose of twist at the low end of the rpm band, while also enjoying solid power at the top – a nice combo, indeed. Pair the boosted ICE and electric motor as a single unit, and you get nice dose of twist at the low end of the rpm band, while also enjoying solid power at the top – a nice combo, indeed. 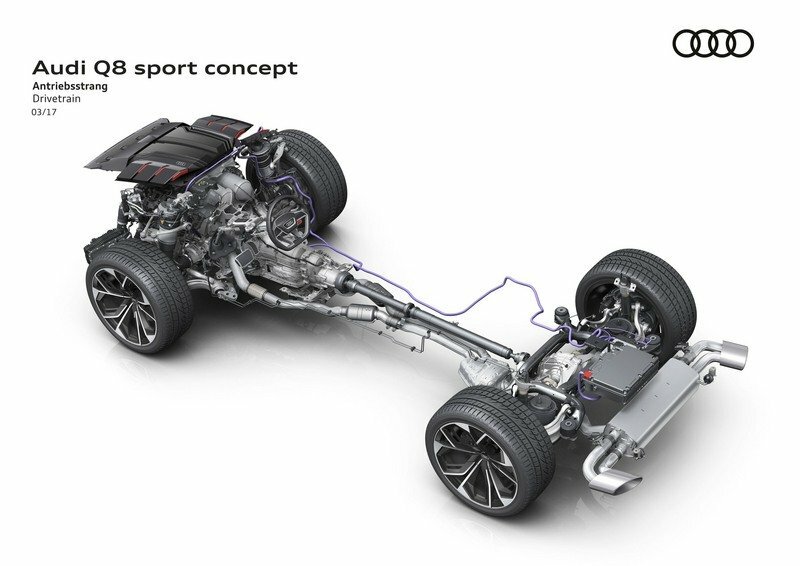 Furthermore, Audi contends that this is the first-ever powertrain to pair a 3.0-liter TFSI six-cylinder with both an electric compressor and a mild hybrid system. Regarding the forced induction, there are two turbos that spool up using the traditional exhaust gas-driven operation. However, there’s also an electrically powered compressor (juiced by a 48-volt electric system) that stuffs even more atmosphere into the cylinders, creating a heap more power in the process. Basically, the set-up places the electric compressor in a bypass on the intake that’s past the boost-fed intercooler, which means its quite close in proximity to the intake manifold. It then uses an electric compressor to create more boost, with the compressor wheel spinning up to 70,000 rpm in less than 250 milliseconds, once again filling the gap left in the lower end of the rpm band, creating all that juicy throttle response and beefing up the torque curve even further. The electric compressor is used to create more boost, with the compressor wheel spinning up to 70,000 rpm in less than 250 milliseconds, once again filling the gap left in the lower end of the rpm band. 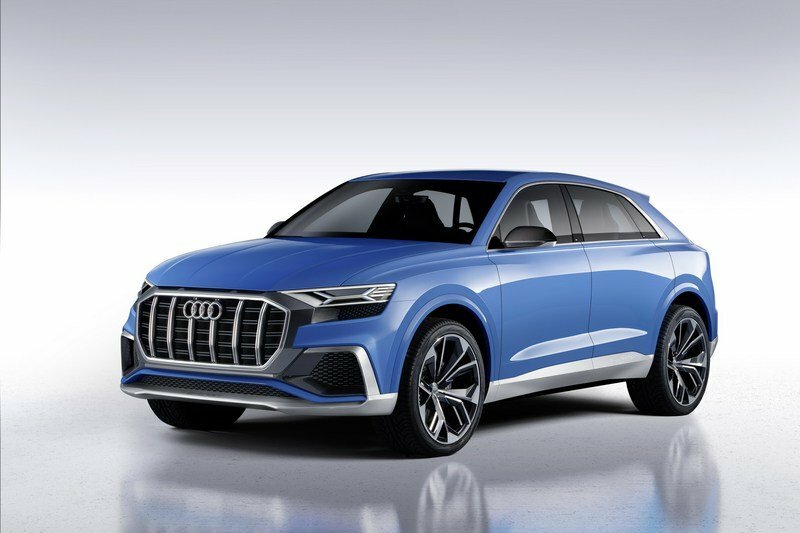 A similar compressor system is already in use on the 435-horsepower Audi SQ7 TDI SUV, and it’s reminiscent of the system Audi used to set a new diesel-powered lap record at the Sachsenring race track in Germany last year. Audi says the twin turbo and compressor combo is like adding two extra cylinders to the V-6 in terms of performance, while also yielding fuel returns like a four-banger. Compared to a standard six-cylinder powertrain, the mHEV manages to drink one less liter of fuel for every 100 km traveled, while also producing 25 g/km (40 g/mile) less in CO2 emissions. For better weight distribution, the lithium-ion battery is placed in back under the cargo area. This unit has a capacity of 0.9 kWh. There’s also a 22.5-gallon fuel tank, and with both the tank and battery filled to the brim, the Q8 manages that previously mentioned 746-mile range. Finally, to help make the most of the complicated powertrain, there’s a smart fuel management system, with provides either lots of go, or lots of efficiency and energy recuperation as needed. It even integrates with the navigation system for predictive efficiency as standard, which will do things like make more power up hills, and draw more braking energy down hills. The fuel management integrates with the navigation system for predictive efficiency as standard, which will do things like make more power traveling up hills, and draw more braking energy traveling down hills. Sounds good to us. More power is always a plus, and if we can get it without burning more fuel, well, that’s just icing on the cake. 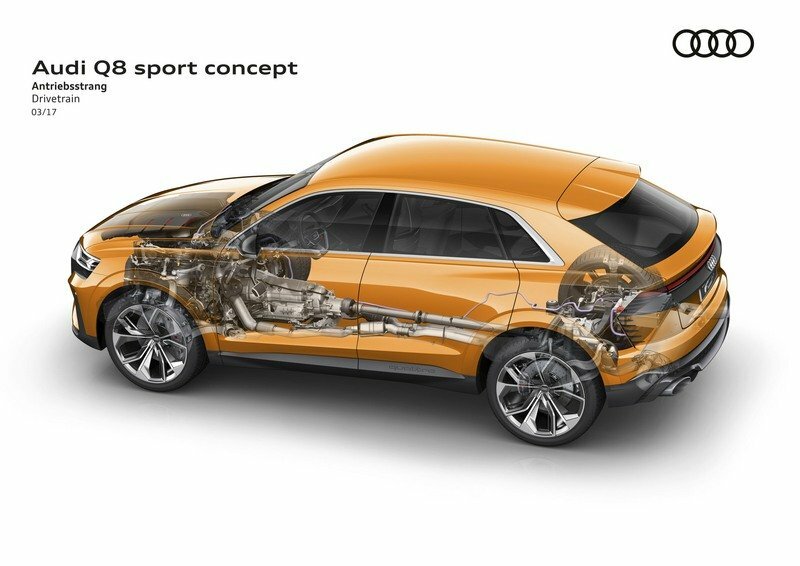 Although it’s a big, heavy SUV, the Q8 Sport Concept gets a suspension system that should keep it feeling relatively sprightly in the corners. It all starts with a five-link set-up for both the front and rear corners, utilizing a lightweight construction. The five-links then incorporate an air suspension system with adaptive dampers, offering both comfort and sportiness as desired. That means multiple drive modes as controlled from the cockpit, plus five different settings for the ride height, each of which are divided into individual 3.5-inch increments. With so much adjustability, you’d expect the Q8 Sport Concept to have the right settings no matter the conditions, whether it’s cruising down the freeway, attacking a few corners, or rumbling around off road. With so much adjustability, you’d expect the Q8 Sport Concept to have the right settings no matter the conditions, whether it’s cruising down the freeway, attacking a few corners, or rumbling around off road. The tires are sized at 305/35R23, and come mounted on wheels sized at 11J x 23. Those are rather large rollers for something that’s supposed to be somewhat efficient, so if max mpg is a concern, skinnier low-rolling resistance rubber should help substantially – at the cost of performance, of course. The wheel design uses a five Y-spoke design. Finally, massive ceramic brake discs are used to haul it all down, measuring in at a staggering 20 inches in diameter. 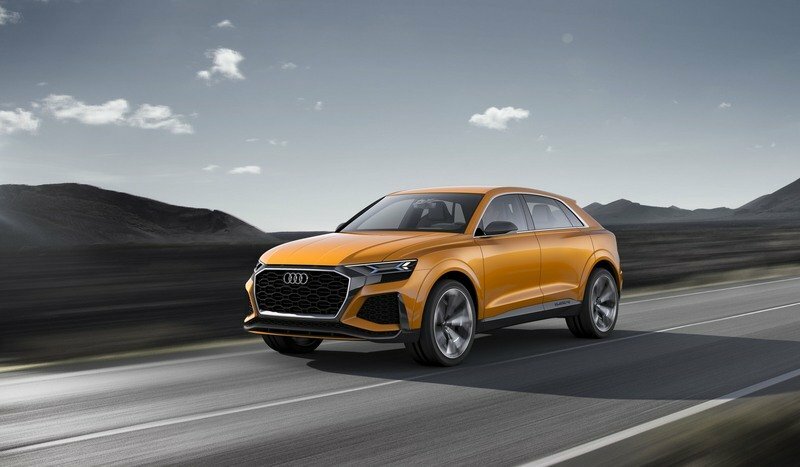 There’s a lot to like about the Audi Q8 Sport Concept. It’s a striking piece of design, with attractive lines for the exterior and interior. The cabin in particular looks ready to hit production, and I hope Audi considers it ready to go as-is. Audi’s current production cabin design isn’t bad, but I think it could use the geometric glitz on display here. The best thing about this concept is its powertrain. 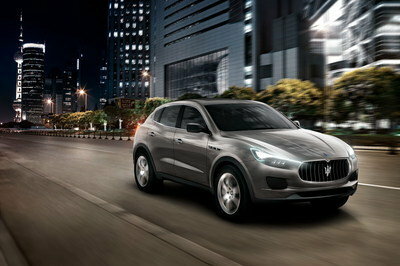 However, the best thing about this concept is its powertrain. While pairing a 3.0-liter TFSI with hybrid power and an electric compressor is a rather complex means of making horsepower, the results speak for themselves. And yes, this is still a concept, but the specificity of the horsepower and torque figures, mpg figures, and acceleration figures tell me Audi isn’t blowing smoke on this one. These are likely the numbers consumers will enjoy when this thing hits production, or at least they’re in the general ballpark. We’ll see how close the production iteration is to the concept when it debuts. Either way, we’re excited to see this powertrain in action, whether it’s on an SUV, or somewhere else in the Audi lineup. Still just a concept, when will we see it in production?